It beggars belief, but it is true. Last week, a group of influential politicians who inhabit the rarefied but influential world of Washington DC think-tanks proposed that US government officials be given the right to sit in on the European Union's inter-governmental conference and on meetings of its other executive bodies so that the USA can keep an eye on the direction Europe is taking. The cat, therefore, is finally out of the bag: American politicians are now so seriously worried that the European Union might be emerging as some kind of independent force that they are trying to work out a way of preventing this from ever happening. The suggestion that US officials attend the highest-level European inter-governmental meetings was made on 14th May 2003 by the Center for Strategic and International Studies. The proposal was signed by one of those ephemeral constellations into which the luminaries of the American political establishment frequently arrange themselves in order to encourage policy to navigate by their lights: Madeleine Albright, Harold Brown, Zbigniew Brzezinski, Frank Carlucci, Warren Christopher, William Cohen, Bob Dole, Lawrence Eagleburger, Stuart Eizenstat, Al Haig, Lee Hamilton, John Hamre, Sam Nunn, Paul O'Neill, Charles Rob, William Roth, and James Schlesinger. That makes four former Secretaries of State, one former National Security Adviser, two former Secretaries for Defense, a former Secretary of the Treasury, a former Secretary of the Department of Housing and Urban Development, a former Director of the CIA, and three Senators. This distinguished and powerful group expresses concern that Europe and the United States are drifting apart. While reiterating the traditional US commitment to the integration of the European Union, the group stresses that "There is also an urgent need for Europeans to do more to reassure Americans that the union they are completing will continue to make the United States feel welcome in Europe." In particular, say the authors, it is wrong for Europeans to present their achievements as "challenging" the United States. "Rather, more should be done to reinforce the perception that the 'finality' of Europe is being developed in cooperation with the United States." To this end, the authors of the Declaration suggest that US officials should be allowed to monitor the meetings of the European Convention, the body charged with drawing up a European Constitution, and of the Intergovernmental Conference which will take over from the Convention in the second half of this year. The authors also suggest that, once the new constitution is approved, provision be made for members of the US government to be "associated on appropriate issues with the work of separate European Councils." The European Councils are the meetings of EU ministers which make policy and law for the whole of the European Union, so this means that the states of the European Union, which are among the richest and most powerful states in the world, should invite US government officials to attend their highest-level legislative and policy-making meetings, in order that these officials can ensure that the Europeans do not pursue policies which are independent of, or disapproved by, the American government. That cosy relationship went suddenly sour on the evening of 10th March 2003, when Chirac announced that France would veto the Anglo-American UN Security Council Resolution permitting an attack on Iraq. From being the closest of allies, Britain and France reverted to type and became the sharpest of enemies. 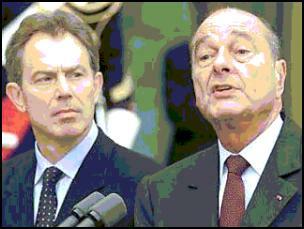 The 10 Downing Street spin machine briefed massively against France in general and Chirac in particular, deliberately distorting what he had said on television. Blair's sudden reversal of foreign policy priorities could not have been more fundamental. 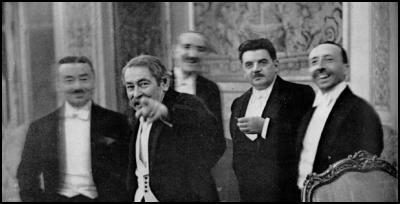 Whereas he had built six years of diplomacy on the previously correct assumption that European integration and the Atlantic alliance were complementary, not contradictory, he suddenly found that the Franco-German axis was indeed lining up against Washington. Whereas Blair had repeatedly insisted that there was no choice between Europe and America - he said in 2000, "I believe stronger with America makes us stronger in Europe. Stronger in Europe and we are a better ally to America. I never believe we need or should choose between the two"  - he now found that he did have to make that choice. And he chose America. This choice, the most fundamental decision to be taken in British foreign policy since at least 1972, was reflected in the heavy leaks to the British press last week that the United Kingdom will not, after all, abolish the pound sterling and adopt the euro. It is difficult to exaggerate the importance of this momentous decision, which flies in the face of everything Blair has said he stands for. It now seems certain that on 9th June the cabinet will decide, on advice from the Treasury, that there should be no attempt to join the European single currency in the lifetime of the present Parliament. In our view, this means that Britain will never join it. To make things even clearer, the extreme pro-European British Minister for Europe, Peter Hain, was despatched to the European Convention to tell the other member states that Britain rejected the concept of a common European foreign policy subject to majority vote. Hain demanded that foreign policy remain a matter for national sovereignty, and that all European initiatives be subject to a national veto. If correct, this all supports the view that one of the reasons why the US and Britain attacked Iraq was to bolster the dollar against the euro. In 2000, Iraq had started to denominate its oil sales in the new European currency, and it invited other oil-producing nations to do the same. Had they followed suit, the pre-eminent role of the dollar in the international system would have come under severe strain. The need for dollars to buy oil is one of the main things which bolsters world demand for the American currency, which in turn means that the US can live off debt by issuing ever greater amounts of currency to pay for its imports. By contrast, if the world demand for dollars ever faltered, which would happen if it were no longer required for the purchase of oil, then the value of the currency could collapse. We can be sure that the new Anglo-American resolution, presented last week to the UN Security Council - but not, to my knowledge, made public - contains a key proposal to re-denominate in dollars the oil sales of Iraq, which will be controlled by the Occupying Powers, Britain and America. 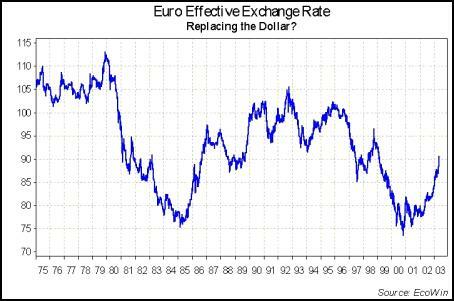 The principal threat to the pre-eminence of the dollar is obviously the euro. If the US was prepared to fight a war to protect the dollar, it would hardly give away the fruits of victory by allowing its principal ally to join the rival currency camp. If Britain were now to announce its intention to adopt the euro, this would crown the euro zone with the inclusion of the London capital market, one of the biggest in the world, and it would reverse the highly anomalous status quo in which Europe's financial capital city is outside the European currency zone. In short, a British decision to join would bolster the euro project immeasurably. That is why such a decision will never be taken. 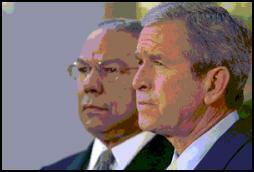 As if on orders from Washington, Tony Blair has thrown six years of diplomacy into reverse. Britain's decision to remain outside the euro zone now looks, therefore, like a key component of the Anglo-American strategy to encircle and contain the Franco-German core: it looks, in other words, like the monetary equivalent of the military re-location of American bases to the European periphery. Welcome to the new Europe, and welcome to the new world order. The text of the bill can be viewed on http://thomas.loc.gov/ The Bill number is H.R. 2050. Speech on the occasion of Bill Clinton's visit to the University of Warwick, 14th December 2000, http://www.clinton.warwick.ac.uk/blairspch.html. You might have missed . . .
23. Endorses the exercise of the responsibilities stated in this resolution by the Authority for an initial period of 12 months from the date of the adoption of this resolution, to continue thereafter as necessary unless the Security Council decides otherwise. © Copyright Sanders Research Associates Ltd. 2003. The contents of the following, either in whole or in part, may not be reproduced, stored or transmitted in any form or by any means, electronic, photocopying, recording or otherwise without the written permission of Sanders Research Associates. While considering the contents to be reliable, SRA take no responsibility for the information set forth herein. ENQUIRIES & CORRESPONDENCE: EDITORIAL OF F I C E : P.O. B OX 221, HEMEL HEMPSTEAD HERTS HP1 3TJ, U. K .
Find more from John Laughland on InfoPages.